Recently, one of our clients approached us about scouring the cities of Palm Beach County for the most attractive grant programs targeting downtown redevelopment and local business growth. What we found was shocking. While we were aware of the prominent grant programs offered by turnaround districts like downtown Boynton Beach, our committee was awed at the abundance and diversity of municipal funds available to almost all business types in almost every major city in Palm Beach County. If you’re considering opening a new business anywhere in Southern Florida, check out our list of the top grant programs in South Florida. $25,000 for New Business / $10,000 for existing businesses. Special Project Grant: $25,000 for new businesses. Must adhere to strict application dates and only a few select companies will be awarded the grant. New businesses complete a "Business Intake Form, " and the Delray Beach Community Redevelopment Agency (CRA) helps to determine the level of need and the amount of assistance new businesses will receive. 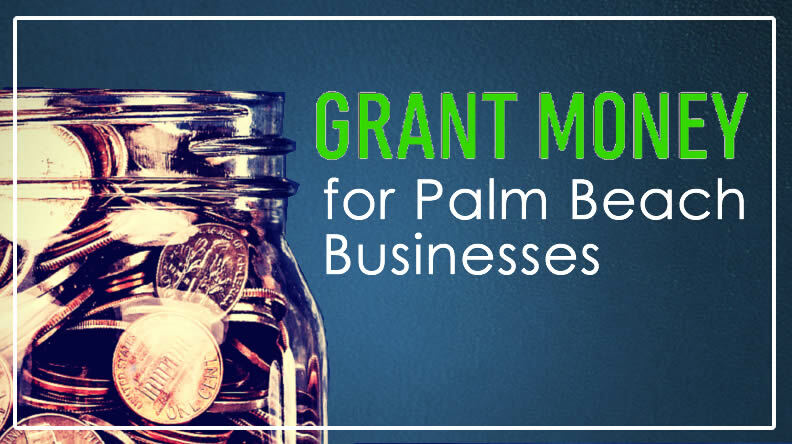 The average new business applicant in Delray Beach receives $1,500 in grant assistance from the Delray Beach CRA. No enacted grant programs for new businesses. Any company interested in expanding business operations should contact the Lake Park CRA directly to inquire about public assistance. From time to time, the Riviera Beach will provide monetary grants to businesses within City boundaries. Currently, there are no active grant programs published for new ventures. 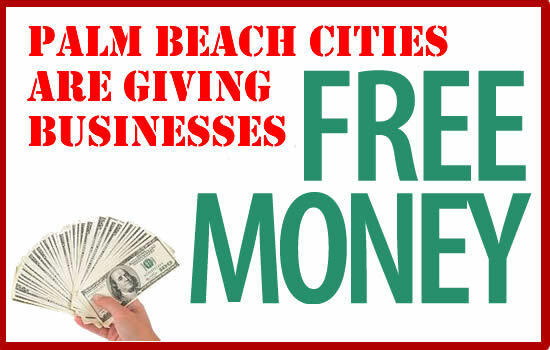 The Riviera Beach CRA offers Small Business Loans from $10,000 to $1 Million. The loan carries favorable terms to business owners and requires less diligent underwriting standards for business owners with slightly blemished credit. Loans are issued based on an application made to directly to the CRA. Boca Raton does offer business assistance programs, but they are primarily tailored to enticing new corporations to the city. Boca provides matching state funds and some architectural and engineering support, but these are predominantly geared towards large business entities and not intended for new small businesses. Grants are a great way for local cities to attract new small businesses. But, as the old saying goes "There’s no such thing as free money." Yes, these grants are intended to be free of charge, without any repayment terms or additional monetary leverage. However, grant money is not free money. Many times municipalities providing business assistance funds require layers of application and council scrutiny before awarding any monies to the firm. Additionally, the company may become e somewhat hindered as dynamic changes are not permitted – if a business commits to utilizing grant funds for a particular use, there is little deviation from the submitted plans. In the opening example, we soon realized that our clients were "chasing" grant money around Palm Beach County. This strategy was never going to work. Rather than focus on the market data and trending information relevant to each location, the available levels of public assistance became the topic of conversation when viewing available properties. Moreover, grant programs take time. We found no landlords willing to wait this period or provide contingency clauses allowing for lease termination if a tenant was unsuccessful in obtaining grant money. Our advice to the new restaurant: Pick the spot that works best for your business. Then, we will facilitate your grant application and hope to receive some assistance from the local CRA. If we can get funds for you, great! But don’t rely on this money for your location development or financial models. Grants are perfect for small businesses and most of the time, the staff at each city’s CRA is delighted to walk new businesses through the grant application process. Still, make sure that your business is in a location that can survive without grant money. Sometimes there is a reason that cities are giving away money to businesses willing to operation within specific areas. If you’re interesting in obtaining business incentives within Palm Beach County, contact Keller Williams Commercial Real Estate. We will help you find the ideal intersection of location and incentive opportunity.